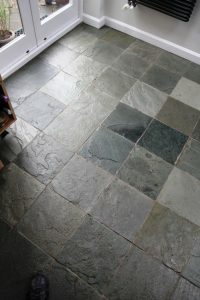 This customer was very happy to find there was a Tile Doctor in Derbyshire, for a long time they had experienced problems with cleaning their fantastic Chinese Riven Slate tiled kitchen floor. The customer had attempted to carry out some amateur maintenance work on a couple of occasions but had never managed to achieve the results they had hoped for. Thus the floor remained dull and afflicted with a large amount of ingrained dirt. I visited the property, located in Chesterfield, to see what could be done to restore the condition and appearance of the tiles. In order to begin the cleaning process, it was first necessary to remove many layers of old and ineffectual sealer from the tiles. 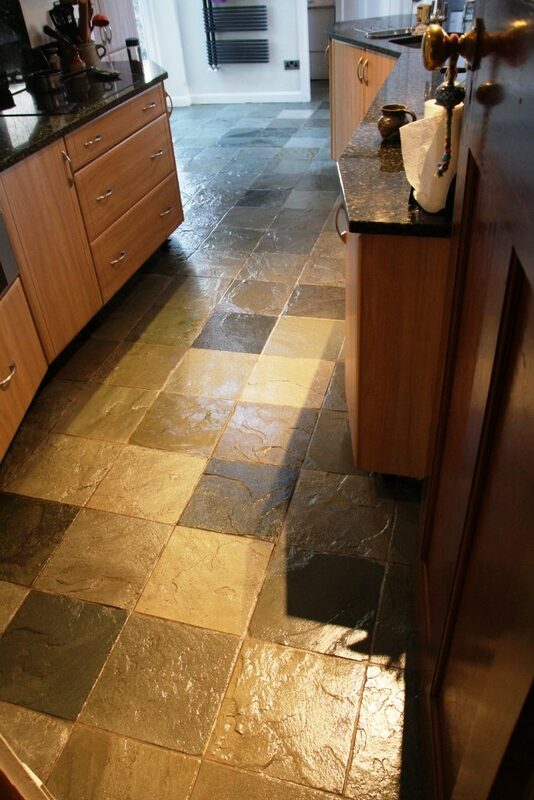 Dirt had become trapped in the sealer, and the was worsened by the fact that the customer had continued, year on year, to reseal the tiles without removing the existing sealer. most sealers. And while it worked in most places, it couldn’t get rid of all the sealer. I opted in this scenario to mix the Remove & Go with Tile Doctor NanoTech HBU, a powerful cleaner and remover that uses nano-sized particles to tackle the toughest of stains, substance build-up and ingrained dirt. The combination of these two products worked exceptionally well not only to remove the old sealer, but also several years’ worth of muck, without any additional problems. 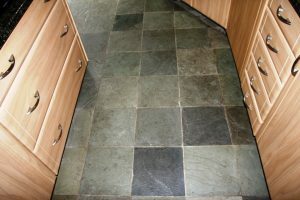 I follow the cleaning with a through rinse with clean water to remove any chemicals left on the floor. Finally, I left the tiles to dry out overnight. When I returned to the property the following morning I had to make sure that the floor was completely dry by running several damp tests. This is exceptionally Important as any excess moisture can cloud my fresh sealer you choose to apply, potentially damaging its performance. I found a couple of damp places and worked on them with my heat gun until they were no longer a problem. When the floor was completely dry I applied 5 coats of Tile Doctor Seal & Go sealer which is a water-based blend of acrylic polymers that gives you stain resistant surface protection and a long lasting low-sheen finish. 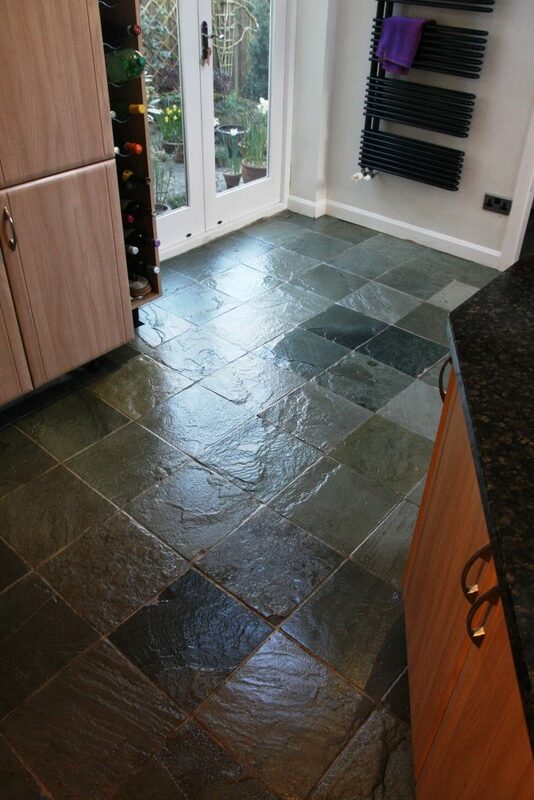 This entry was posted in Work History and tagged Chesterfield, Chinese, cleaned, derbyshire, Restored, Riven, sealed, Slate, Tiles by TileProf. Bookmark the permalink.